Gillian Kyle Ltd's Tunnocks Caramel Wafer Pinny! Plus, a real selling point for me is that they are made from Organic Cotton: Thanks Gillian! Find out why this is so important on her website. Seriously, who could possibly turn down a Tunnock Caramel Wafer?? 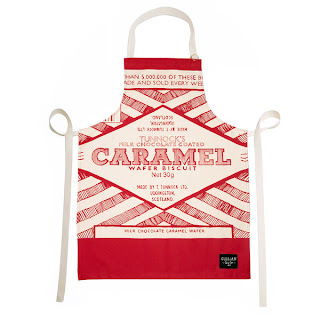 I am a huge fan of both the wafer's and this pinny; it's fun, it's bright, it's everything you want from a kitchen aid and snack. Who wants a boring pinny?!? Go and check out this and all her other pinny's here!! Enjoy.